This entry was posted in Uncategorized and tagged Clive Barker, Demons, Phil Fondacaro, SHU, Tales From The Darkside, The Yattering and Jack. I need to scour my brain now, thank you very much. I just assumed that Jack knew about the demon law from his mother, since she was a practicing member of the Church of Lost Salvation. I felt for the Yattering, too, and Barker did a great job of giving his monsters unique POVs–the Yattering is nothing like Rex, and the story wouldn’t have worked half as well if they were similar, pure-evil killing machines. Now I have to watch that Tales from the Darkside episode…. I know somewhere in the story Jack mentions doing “research.” Maybe he did that while he was gherkin-trading, read up on some demonic lore on his lunch? All of the timing stuff seemed off too. We know the Yattering has only been there for about six months, and in that time Jack’s wife cheats on him a lot then leaves and ends up killing herself. And then when the daughters come home, there is absolutely NO MENTION of the wife (who is presumably their mother?). Wouldn’t they be upset that this is their first Christmas without her? That part bothered me a little. Their mother cheated on Jack before that and left him, so I presumed perhaps this wasn’t technically their first Christmas without her or that they might have been used to a holiday with their parents separated/divorced. Yes, but the Yattering talks about it like he was able to watch the whole thing. Time is just off for this whole story. I thought the same thing Christe did. Why is there no mention at all of the wife? You don’t just forget your mother, especially on Christmas. I didn’t even pick up on that – although I thought that the suicide was kind of wedged in as it was. And from a theological standpoint, one could argue that Jack was the indirect cause of her death and, as such, was condemned to hell anyway. Unrelated: did anybody else have to look up what a gherkin is? Ugh, the ’80s, why do you have to be all bad at adapting genre fiction? And man, but I dislike casting little people in roles like this. It’s lazy and offensive and while I understand that CGI wasn’t really a thing back when that episode was made, it seems like they still could have cast an actor of ANY height and done some creative camera work with perspective and oversized objects to make him seem small. I agree completely. I’m all for casting little people in roles but it should be because they are excellent actors, not because of their height. But that is a rant for another day. Yeah, the mom suicide…. 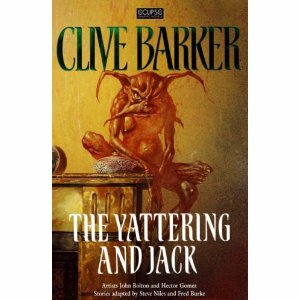 It kinda made it seem like Jack was his wife’s Yattering. Not in an annoying way, but in an ignoring way. She went insane trying to get his attention. He was way to chill about the consequences of that act. I saw the P.O.V. as a form of omniscient. It made sense with some of the history provided, including the information about Jack’s wife and his mother. The multiple points of view is so essential to telling this story that I didn’t consider it head-hopping. I did briefly wonder how Jack knew about the Yattering to do his research, but assumed his mother told him before her reversion.